Fine condition hardback book. Clean tight and unmarked. Slight fading to spine of dustjacket, otherwise it is Very Good. The author, a lieutenant-colonel, ranks as one of the leading aces of the Allied Forces in World War II and is officially credited with 32 enemy aircraft destroyed. 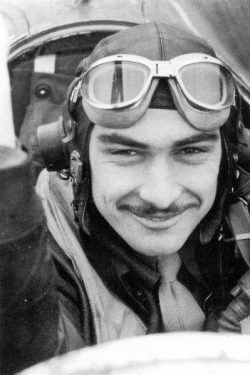 Goodson was one of the first US volunteers; he survived the sinking of ATHENIA when she was torpedoed, and after training joined the RAF’s 133 Eagle Squadron in which he became a fighter pilot. He flew in continuous combat in Hurricanes and Spitfires before transferring to the US 4th Fighter Group flying Thunderbolts and Mustangs. 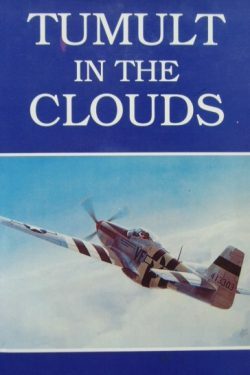 This book contains some great first hand accounts of aerial combat as well as stories of the fabulous pilots who flew with Goodson in the Eagle Squadrons and the 4th FG such as Blakeslee, Gentile, Godfrey and Kid Hofer. 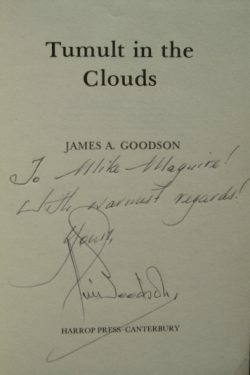 By early 1944, Colonel Goodson was one of the most famous squadron commanders in the Eighth Air Force before he himself was shot down when he strayed over a German airfield whilst attacking an Me163 rocket fighter. This classic book is well written, exciting and as such has been selected to be re-published as one of the Centenary Collection of books to celebrate 100 years of the RAF. This copy is enhanced by a very collectable signature.